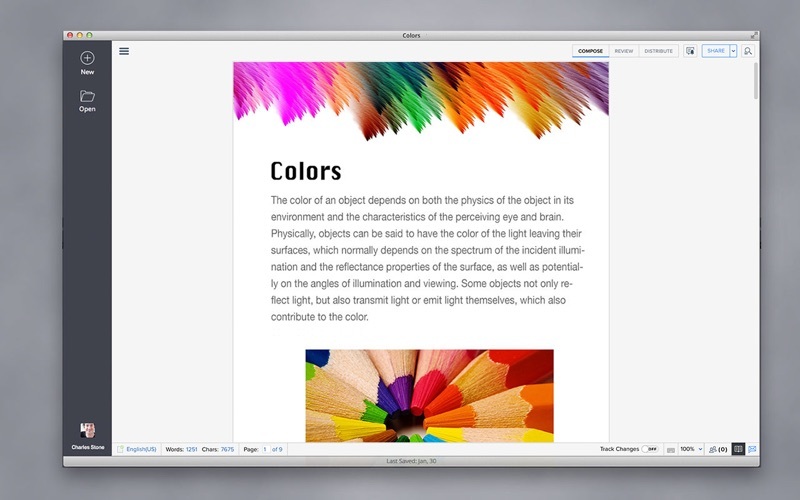 Writer is a powerful word processor for the Mac. Create beautiful documents with several writing tools with great flexibility and ease. Create a document and start typing away with several font and formatting options. With Writer, all documents created are stored in the cloud allowing you to access your documents from anywhere. With the power of the cloud, your documents are all auto-versioning, making sure you never lose anything. You can share the documents with detailed permissions and collaboratively edit the documents with multiple users simultaneously. 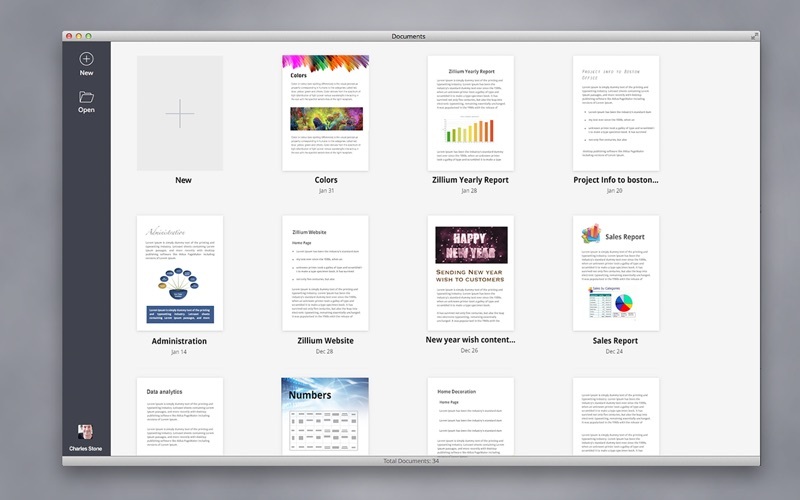 HIGHLIGHTS - A beautiful user interface that lets you focus on the document you are working on. - The MenuTab toolbar that allows you to access various features through a Menu as well as a Tab interface. - Save your documents in Microsoft Word (.doc, .docx), Open Office formats, PDF, RTF and other formats. - Format your documents using various fonts and formatting options - Insert images, tables, shapes, symbols and equations into your documents. - Add endnotes, footnotes, page numbers, table of contents and view word counts and more to your documents. - Flexible page layout options to change page size and orientation with various options. - Define custom margins, add headers, footers, page colors and watermarks to your document. - Make no mistake with inbuilt spell check in 40+ languages and Thesaurus. - Never lose any data with auto versioning. All versions of your documents are stored allowing you to go back and revert back unwanted changes. - Share your documents with others with specific sharing permissions - read-only or read-write. - Publish your documents on the web. Default is always private. - Download the printable version of the document in PDF format to print your document. 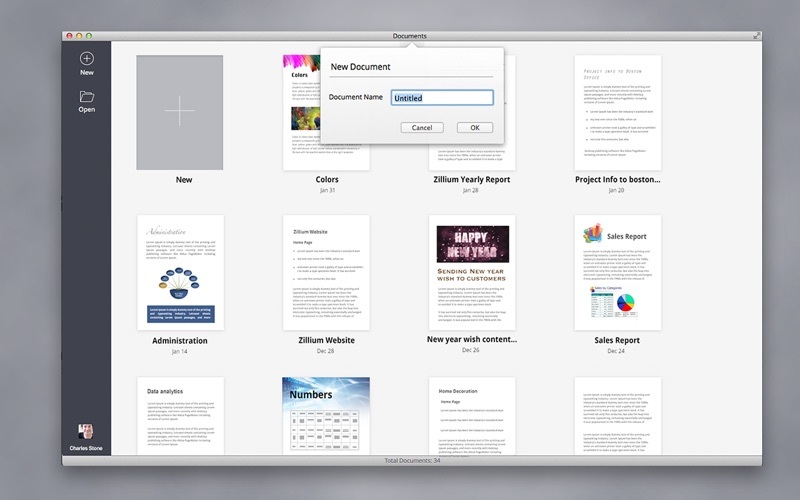 - Collaboratively work on documents. Multiple users editing the same document at the same time viewing changes in real-time. As the documents are stored in the cloud, you will require an internet connection to create and access your documents. Please share your feedback at support@zohowriter.com. Can’t even title new doc without crashing. Worthless. Very interesting and potential to be a lean mean tool. I would like to suggest that it supports Share Menu for 3rd party extension sharing with other apps. Namely Zoho Notebook (and vice versa) and Evernote, Devonthink. I love Zoho Writer! I is an awesome product BUT... It crashes every 12 seconds. :( PLESAE FIX this problem ZOHO! You can do better than THIS! Please respond to this Zoho. I would like to hear back... Thanks! Really wanted to like this program. First thing I noticed isI tried to change the font color of green to black and it wouldn’t let me. Then after playing in the program for 25 minutes and it self closing “crashing” I decided I can probably find a better program. Deleted it. Also didnt like the fact that I had to sign into the clud everytime I opened the program. So far, I’m liking the Writer app, but I’d like to see a few more features. I’d like a more robust grammar/spelling tool, or team with Grammarly. I would like to have the option to show formatting like paragraphs, line/page breaks, etc. I haven’t added any images yet, so don’t know how it performs in that arena. Other than that in my short time using it, it seems clean and easy to use. Awesome all around app. Love it. Our company uses Zoho to power all e-communications. Overall, we are pleased with Zoho’s suite of apps. The browser version of Writer is good but limited by your local internet speed. I hoped the desktop version would be faster and smoother. I’m having issues with the cursor not lining up in the correct spot so I end up deleting a letter one or two spaces to the left of my intended correction. Also, the app crashed three times when I was working in a table. It holds good potential, but it still buggy. I’m going back to the browser version until they can get this figured out. So I have a mid term paper due, wrote it all up and was just going in to make some final changes and Zoho asks me for my username and password I remember my username but not my password, there isn’t a button to ‘recover a password’ on the login, I cannot find any email, and the website was much help neither. I’m going to have to reach out to support or I’m going to fail my mid term. Other then that its a great app, Highly suggested.